The article below, by Partha Pratim Ray, was written for CJI’s Bridging Borders campaign and first appeared on the igNation website on 21 November 2018. Mr. Ray works in communications for the Jesuit Conference of India. Lok Manch (People’s Forum) is an inclusive, secular, human-rights-driven agency that supports various social movements of marginalized people in India. 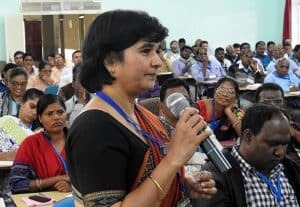 It is envisaged as a forum of, by and for the priority communities — dalits, adivasis (indigenous people), minorities, women, urban poor and others — facilitated and accompanied by the Jesuits and their partners and collaborators from different cultures, languages, religions, regions and ethnic groups. Lok Manch builds bridges between people and resources by accessing and claiming legally recognized entitlements, including those specified under the National Food Security Act (NFSA), the Scheduled Caste Sub-Plan (SCSP, which provides financial and physical benefits for historically disadvantaged people), the Scheduled Tribes Sub-Plan (STSP, providing benefits for indigenous minorities) and the Water, Sanitation and Hygiene program (WASH, which focuses on universal access to key public health resources). To use these legal tools, Lok Manch works to identify leaders from marginalized communities and builds capacity so that communities can take charge of their lives and live with dignity. Grassroots democracy is pivotal to nation building. People at the grassroots must be empowered to develop themselves and Lok Manch is a step forward in this regard. 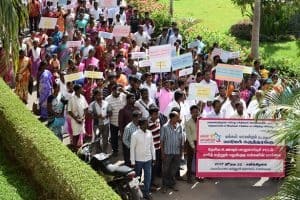 After 16 months of preparation, it officially began in late 2015 with 100 facilitating CSOs (civil society organizations), including a number of Jesuit social centres, from 12 states in India. The forum now reaches out to nearly 300,000 households, focusing on enhancement of their access to entitlements. During the past 3 years, Lok Manch has emerged as a platform to raise the voices of the voiceless against all forms of exploitation. The partner organizations have expanded their knowledge and capacity to empower excluded communities. People now see Lok Manch as their forum, through which they can achieve a lot. This is the story of Mina Beni, who courageously stopped child marriage in the village of Shikarpur, in Rajganj in the Siliguri district of West Bengal. Mina was highly inspired by the activities of Lok Manch members in her village. On the evening of 13 August 2017, she observed that two families in her village were preparing to get their minor children married — a 14-year-old boy and a 17-year-old girl. Mina tried to dissuade the families, but in vain. Finally, she informed the police and the Block Development Officer of Rajganj. The police contacted the relevant ChildLine member and together they came forward to stop the marriage. It was a brave step taken by Mina Beni. In Siyandohar village, in Thaitangar in the Simdega district of Jharkhand, a shopkeeper who managed the Public Distribution System of the village used to cheat the 21 beneficiaries he was responsible for while weighing their ration. This continued for a long time and the villagers knew about it. Finally, on 25 August 2017, a group of 30 to 40 women, led by Romola Kullu, went to the shopkeeper and questioned him about his actions, which the shopkeeper vehemently defended. But the women had brought scales with them and they challenged the shopkeeper. They weighed their ration in front of him and found it weighed less than it should by a significant amount. The shopkeeper was caught red-handed by these women; he was deducting 2 to 2.5 kg of ration from every beneficiary. In spite of his excuses, the shopkeeper sensed the mounting pressure posed by the women. He accepted his fault and agreed to distribute the rations properly and vowed never to cheat people again. values of equality, democracy and secularism are practised by partners and community leaders from diverse backgrounds. better coordination with existing state and national networks of marginalized communities. On 1 November 2018, Lok Manch entered into its 2nd phase with a specific focus on “policy engagement” and “strengthening what has been done” during the last 3 years. With grassroots changemakers, now equipped with spirited solidarity from each other and capacity-building support from the National Lok Manch Facilitation Centre and its partners, there is a great potential for this work in the second phase! Grassroots democracy is pivotal to nation building. People at the grassroots must be empowered to develop themselves and Lok Manch is a step forward in this regard.